Actor Ralph Fiennes made his directorial debut in 2011 with “Coriolanus”, an intense reworking of a little-known Shakespeare play. Fiennes starred in the film, as the warmongering titular character who only felt at ease in the carnage of war. His follow-up as actor/director, “The Invisible Woman”, focuses on a little-known period in the life of literary celebrity, Charles Dickens. The period piece continues the visually rich palette of his last film and finds Fiennes once again playing an enigmatic character who is scrutinized and the subject of much controversy. With its stunning cinematography and exquisite art direction, “The Invisible Woman” is an absorbing examination of forbidden love and social isolation. In 1883, Nelly Wharton Robinson (Felicity Jones) is a contently-married schoolteacher married to George Wharton Robinson (Tom Burke) in Margate, England, where she directs school plays performed by young children. Schoolmaster Reverend Benham (John Kavanagh) notices an absence about Nelly and can’t help but notice that she is troubled and of her affinity for the works of Charles Dickens, whose writings line her shelves. He notices that she can often be found walking along the oceanside, where her thoughts drift to memories that resurface, like the uncontrollable tide beside her. These walks serve as an emotional portal to some years earlier in Manchester, where we see a teenage Nelly Ternan (also played by Jones), who enters the world of Charles Dickens (Ralph Fiennes) as a performer in her family of actors, led by her mother Frances (Kristin Scott Thomas). The Ternan family becomes active participants and supporters of the plays acted, written and directed by Dickens, becoming The middle-aged Dickens, who has been in a loveless marriage with Catherine (Joanna Scanlan), which has provided him with children, has become bewitched by the young Nelly, herself a fan of his literary craftsmanship. As Charles becomes renewed by her presence and their increasing closeness, Nelly becomes conflicted as rumors begin to swell of their affair. With Charles putting his reputation at risk during the height of his fame, Nelly experiences heartbreak and tragedy as she is forced into the shadows of his celebrity. The heart of “The Invisible Woman” is effectively told in flashback, as screenwriter Abi Morgan (working from a book by Claire Tomalin) takes viewers back and forth in time, focusing on the both the young and adult Nelly and the impact of Charles Dickens in her life. The memories of the past we see unfold are bittersweet and haunting for the adult Nelly. From infatuation to fallout, Fiennes excellently captures the repressed past of a hidden figure by showcasing the fine nuances of Jones’ performance. An expressive actress, Jones is meticulously framed by Fiennes who studies her hands, her neckline and reactions as the titular character. Fiennes is well-cast as Dickens, playing him as a passionate orator and charismatic presence, but he knows that the focus is to present a period in the famous author’s life that few have known about. It’s not unusual to see a film focusing on the secretive affair of a prominent male figure in history, but it is refreshing to see Morgan’s screenplay shed light on the women affected by Dickens adultery. Beyond Nelly Ternan, there are three other strong female roles that enrich the film. Dicken’s wife, Catherine, who is given a welcome arc of agonizing humiliation and abandonment as her husband indulges his middle-aged fantasies, is played with revealing restraint by Scanlan. This is a surprise, since so often the spouse is seen as a cruel or cold presence in order to justify the actions of the one committing adultery. That’s not the case there, since we don’t feel bad for Dickens due to his selfishness and concern for preserving his social status. The film’s other prominent woman all have significant impact during this time in Nelly’s life. She encounters Caroline Graves (Michelle Fairly), the mistress of Dicken’s best friend, writer Wilkie Collins (Tom Hollander), who gives her an experienced perspective on untraditional relationships. The conversations Nelly has with Catherine and Caroline individually are both uncomfortable and revealing and add to welcome characterizations, providing new challenges for the female protagonist. Also noteworthy is Kristin Scott Thomas as Nelly’s mother, who whispers her own backstage concern for her daughter’s well-being. She knows full well the kind of man Dickens is and the spell he can cast on Nelly, deliberate or not. To create such an experience, Fiennes has surrounded himself with a talented team of filmmakers. Cinematographer Rob Hardy illuminates the rich earth tones of the various interiors with a combination of natural and candle light. It’s a gorgeous work of vibrant textures and tones, accentuated by Michael O’Connor’s (who did equally impressive work on the latest version of “Jane Eyre” a couple years back) Oscar-nominated costume design, who outfits these reserved characters with the appropriately restrained attire of the era. On top of all that, Fiennes reunites with his “Coriolanus” composer, Ilan Eshkeri, delivering an extraordinarily addictive score that could easily be listened to all on its own. 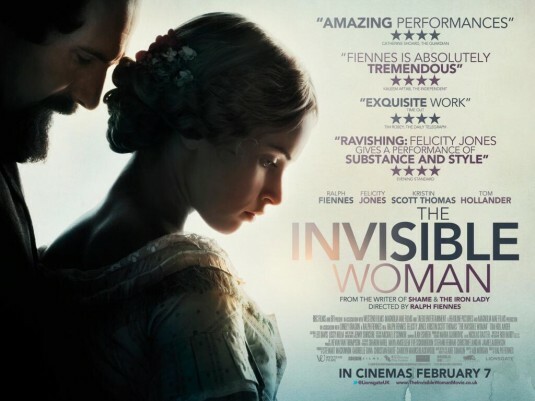 As much as “The Invisible Woman” is Nelly’s story, sharing point of view of their thirteen year love affair, Fiennes’ enthusiastic portrayal of Dickens stands out but never overwhelms the open and vulnerable performance by Jones. Fiennes intent on examining the nuances and expressions of his actors serve to enrich what would ordinarily be a straightforward melodramatic love story. With yet another superbly crafted and performed film behind him, I eagerly await the next directorial endeavor from Fiennes.